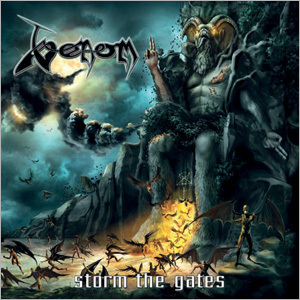 Triptykon/Celtic Frost/Hellhammer :: View topic - Venom's new album "Storm The Gates"
Posted: Sat Sep 15, 2018 1:11 pm Post subject: Venom's new album "Storm The Gates"
Venom will release their new album entitled "Storm The Gates" in december 2018. Your thought about it? Only post on official site. Nothing more, so far. But in my opinion this line-up Rage-Dante-Cronos is the best line-up of Venom. I still love first albums, but I also like "Calm Before The Storm" and Tony Dolan era. And all rest albums. "Metal Black" was the first Venom's album that I heard. And I was shocked, it was the heaviest thing I've ever heard. And the last two albums is my favorite. 100 miles to hell also was good. I hope this album will blast with some more Venom! From The Very Depths was some of the best stuff Venom had done in years, so I can only imagine the new one will be a continuation. I love it, it's sounds more heavy and brutal than songs from "Fallen Angels" or "From The Very Depths". And little bit reminds me "Senile Decay". That sounds great and not a little bit, shall we say, Frosty in places!! !